1) What is the extension of LoadRunner scenario file? 2) How many areas we can do the correlation? 3) Tell something about LoadRunner? 1) LoadRunner is the industry standard automated performance and load testing tool. 2) HP acquired LoadRunner as part of its acquisition of Mercury Interactive. 3) Using LoadRunner one can emulated hundreds and thousand of virtual users for performance and load testing. 4) LoadRunner supports wide range of industry standard applications for load testing. 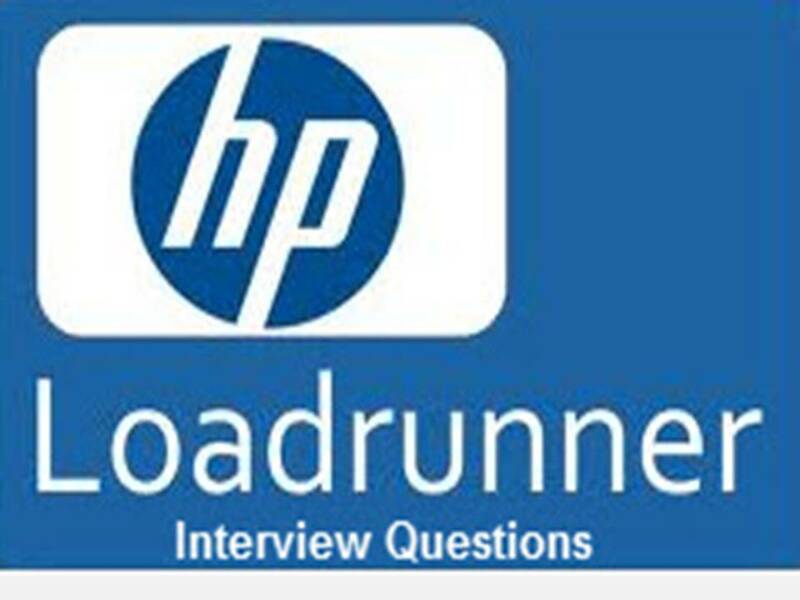 4) What are the features of HP LoadRunner? 1. TruClient technology that simplifies and accelerates scripting for complex Rich Internet applications. 2. Enterprise load generation that applies measurable and repeatable loads while monitoring systems and end-user transactions to identify issues. 3. Powerful analysis and reporting capabilities that help isolate performance bottlenecks quickly and easily. 4.Integrated diagnostics help pinpoint the root causes of application-level issues down to the code level. 5) What is a virtual user or VUser in LoadRunner? Virtual user or Vuser emulates the real user steps. The real user steps are recorded a test script. During the recording time user steps (like posting the requests or accessing the pages) are recorded as test script. When the test script is played back the script is going to perform the user actions. The real user emulation by playing back the script is called virtual user or vuser. The vusers are created as a process or a thread in LoadRunner for multiple users. 6) What are the LoadRunner components? 1. LoadRunner VuGen – Virtual user generator – used for scripting purpose. 2. LoadRunner Controller – used for load test execution and monitoring purpose. 3. LoadRunner Load Generator – used for generating the load of multiple virtual users. 4. LoadRunner Analysis – used for analysis and reporting purpose. 7) What is a transaction in LoadRunner? Transaction is defined as response time of one or more than one user steps. Transaction in LoadRunner is used for measuring the response time of user steps. If one has to measure the response time one or more than one page, the measure statements will be inserted at the appropriate pages. trans1 and trans2 are transaction names, which will have the response times to measure periodically and those response times will be displayed from the graphs in controller during the load test execution and those transaction response times can be analyzed from LoadRunner analysis after load test execution. 8) What is think time in LoadRunner? Think time is nothing but the user delay between two subsequent requests. Assume that a user opened page1 and he is filling the data on page1. During filling the page the user has spent 10 sec, and he has submitted the page1, then page2 is loaded. In this case the user wait time between pag1 and page2 10 sec is called think time. 9) What is tuning in LoadRunner? How to use this tuning option in any project?Any one pls explain me in detail.? We are having different tunings like DB Tuning, Network Tuning, and Server Tuning and so on. The VUGen stands for Virtual User Generator. VuGen is used to generate vuser script (here we record a business operation performed by a single user). 11) What is the analyzer in LoadRunner? This gives you the results of the load runner test. These results can be viewed in graphs and reports. 12) Do we see much difference in load testing for web applications versus traditional software? Yes. From own experience, in traditional applications, the developers know more about how it all works, if it’s in house then developers are easy to access and know the environment. With Web and CMS, there is so much the developers don’t know about, this is especially true when they integrate out of the box solutions. So many software developers now are using solutions they buy from someone else and they are slow to turn around bugs, functional or non-functional. Obviously this depends on a lot again, traditional applications can also fall into these traps, but it’s more common with Web. 13) What are some of the most common web app bottlenecks that you find and/or fix? Some of the most common web app bottlenecks that you find and/or fix: Misconfigured server, poor performing stored procedure, or the application. Less down to infrastructure as most places we have been they spend a lot of money in this area. 14) Have you ever measured application performance re-engineering impact by operations cost reduction? Yes. We can test a work-flow application, and the speed of this application had an impact on both the productivity of a large portion of their workforce, and the performance of their helpdesk staff, which had a direct effect on their reputation. 15) What do you think is the most important aspect of load testing? As mentioned getting the scenario right and answering the business question. No point telling them , “it breaks at 1000 users, when they have 100 people working there and they were concerned only with network latency”. (Simplistic example as we know). 16) What kind of applications LR tests? LR tests Client / Server & Web based applications. Correlation is used to obtain data which are unique for each run of the script and which are generated by nested queries. Correlation provides the value to avoid errors arising out of duplicate values and also optimizing the code (to avoid nested queries). Automatic correlation is where we set some rules for correlation. It can be application server specific. Here values are replaced by data which are created by these rules. In manual correlation, the value we want to correlate is scanned and create correlation is used to correlate. 19) How do you find out where correlation is required? In two ways we can find out where correlation is required. First we can scan for correlations, and see the list of values which can be correlated. From this we can pick a value to be correlated. Secondly, we can record two scripts and compare them. We can look up the difference file to see for the values which needed to be correlated. 20) Why do you create parameters? Parameters are like script variables. They are used to vary input to the server and to emulate real users. Different sets of data are sent to the server each time the script is run. Better simulate the usage model for more accurate testing from the Controller; one script can emulate many different users on the system. 21) What is the controller in LoadRunner? The more important and critical component of LoadRunner is the Controller. LoadRunner uses the Controller to emulate the real time users. Here is where we configure our scenario settings like Scripts need to be executed, No of Vusers, Load Generators, Run-time settings, Load test duration etc..
22) What is the use of Scheduler? We can use the LoadRunner Scheduler to set up a scenario to run automatically. 23) What are the reasons why parameterization is necessary when load testing the Web server and the database server? 1. We can use different data in scripts dynamically. 2. When URLs of AUT are parameterized, it becomes easy for the script to point to different application environments, i.e. Dev, QA or Prod depending upon the requirements. 3. Parameterizing helps in emulation real scenario as it avoids caching effect, if we send same data again and again while running scripts in iteration, then the data could be used from cache or from the temporary table from the database. Now if we send different data in each iteration the real performnace transaction timers can be measured. 24) What is the difference between hits/second and requests/second? Hits per second means the number of hits the vserver receives in one second from the vuser and the request per second is the no. of request the vuser will request from the server. 25) What is the advantage of using LoadRunner? 5. Everything done from a single point.